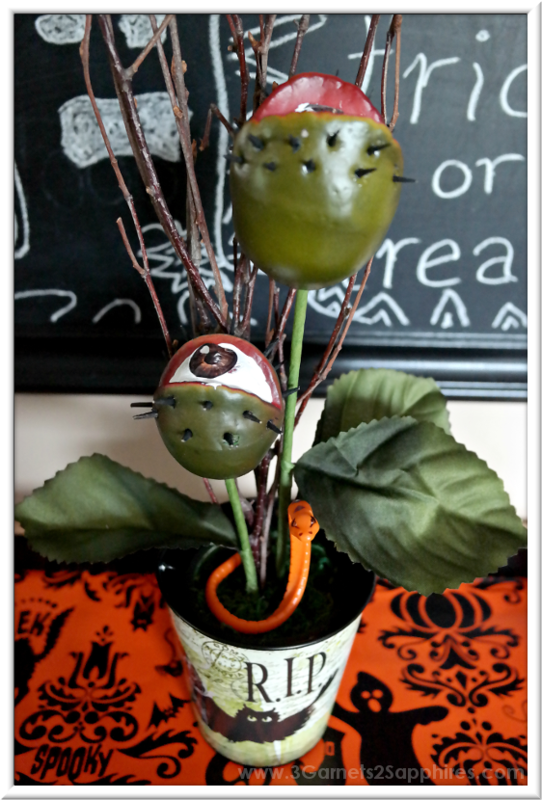 This easy Halloween centerpiece post has been sponsored by Oriental Trading Company, your Halloween headquarters. All opinions expressed are my own. October is a busy time of year for us, especially now that my children are older and are not all at the same school. Between all the fall festivals, fundraising, and help with homework, I hardly have time to even think about Halloween. That's why I was super-excited to come up with an easy Halloween centerpiece that both my children and trick-or-treaters would appreciate. 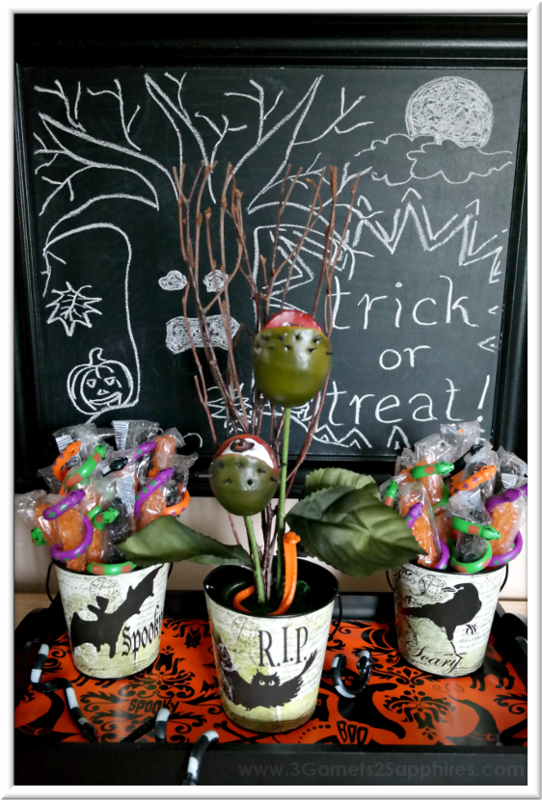 Putting together an easy display like this would be a fun Halloween activity to get the children involved in. That's right! 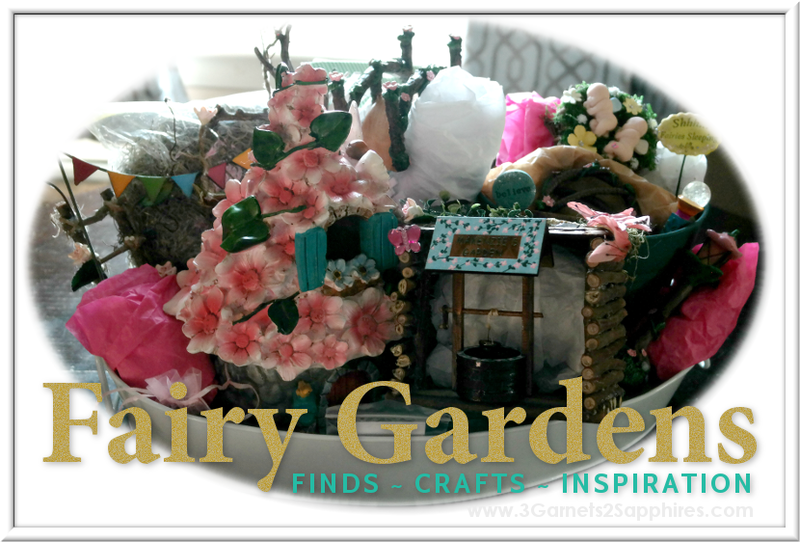 This centerpiece is so easy to make that a child could probably do it. 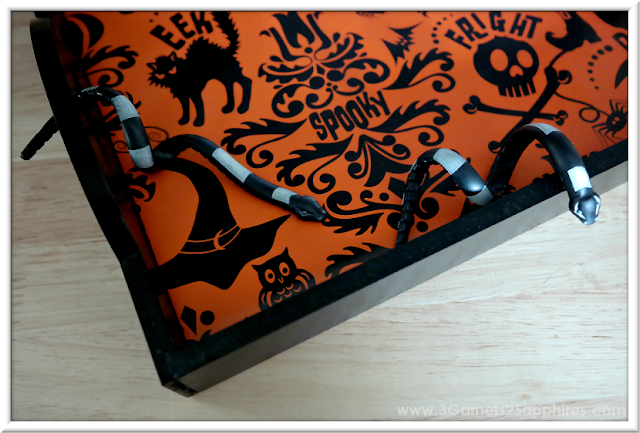 How to Make a Halloween Serving Tray . 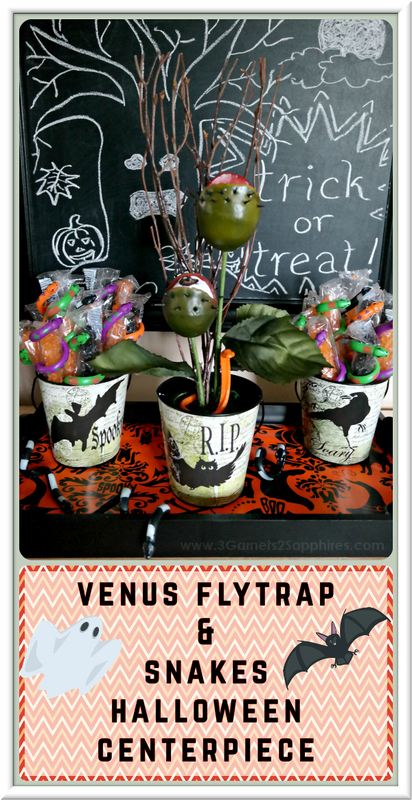 . .
All you need is a basic serving tray and some printed Halloween-themed paper. 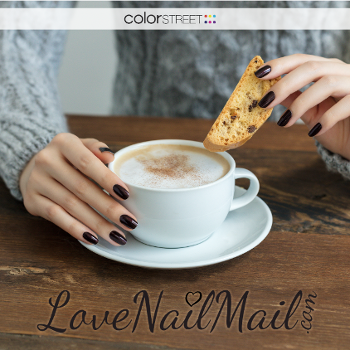 The tray can be black, woodtone, brown, orange, green, purple, or any other color that reminds you of fall. Then measure the inside dimensions of the tray and fold the edges of the printed paper under itself to match the tray measurements. Then place it inside the tray. That's it! I chose not to glue the paper down so that I can switch it out for different themed paper in the future. 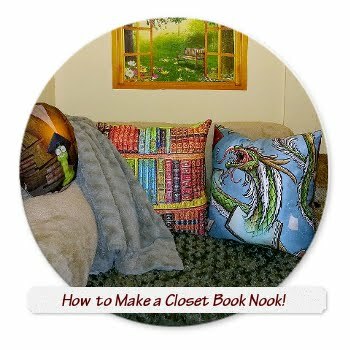 The printed paper could be from scrapbook paper, wrapping paper, or a Halloween bag. Use your imagination! I used part of a paper Halloween table runner. How to Make Snake-Wrapped Rock Candy . . . It's tough finding candy that everyone will like that is also safe for children with allergies. I discovered that rock candy is gluten-free and dairy-free. 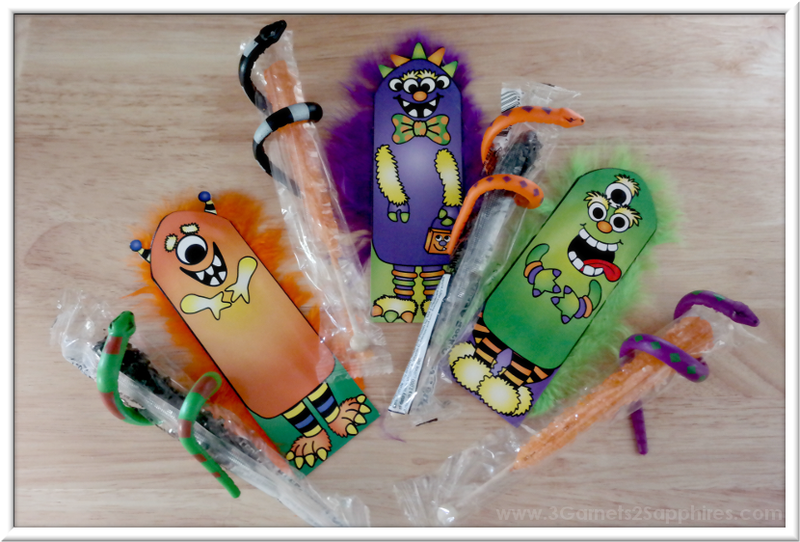 These rock candy lollipops paired with some cute fuzzy hair monster bookmarks are sure to be a big hit with trick-or-treaters, even ones with some dietary restrictions. Here comes the fun part! To wrap bendable snakes around the rock candy, first coil them around your index finger. When the snakes are in a coil shape, wrap them around the rock candy lollipops. 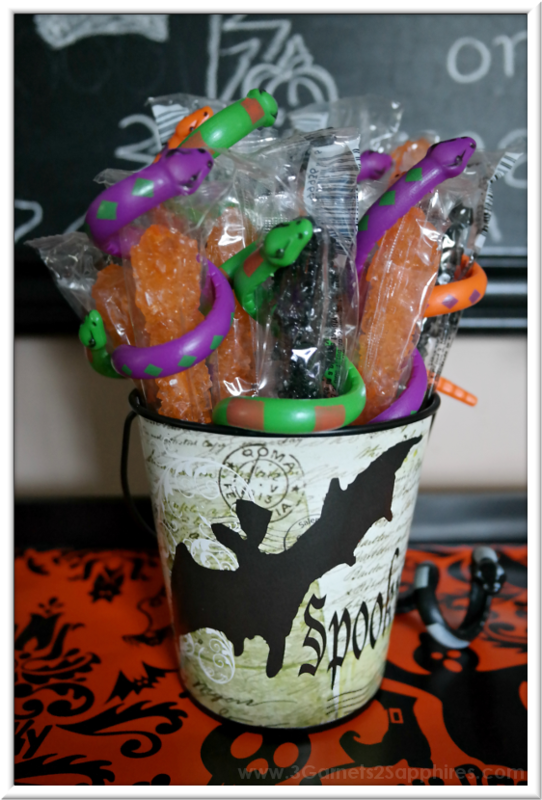 If you intend to display these treats in a cup or a pail, like I have, then be sure to keep the snakes towards the top of the lollipops. 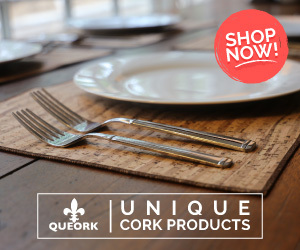 This would also work well with hard candy sticks. How to Put Together Your Halloween Centerpiece . . . 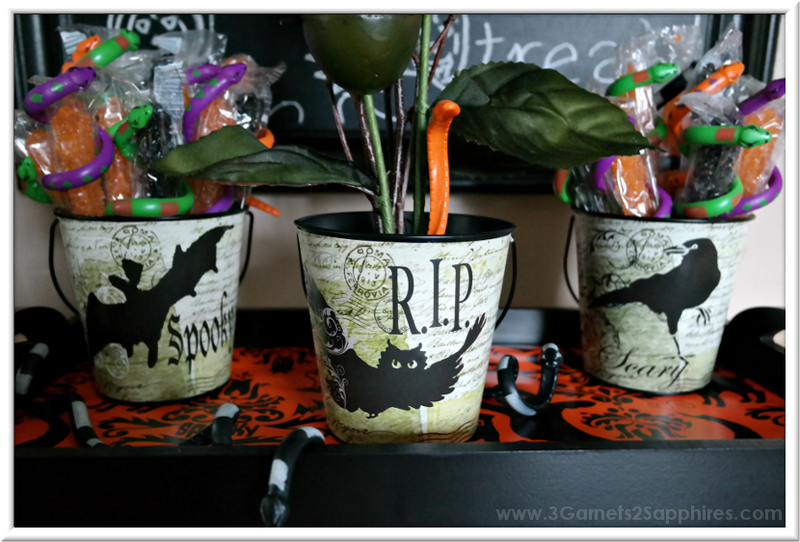 I was lucky to find a set of 3 Halloween pails that I fell in love with. Either little pails or flowerpots would work well in this case. The first pail is for holding your decorative Venus Flytrap plant. The other two pails are for holding your snake-wrapped rock candy lollipops. Place the three pails in the Halloween serving tray you created. Add a few snakes here and there, and you're done! Like this Halloween decor idea? Pin It for later . . .
What ideas do you have to delight trick-or-treaters? 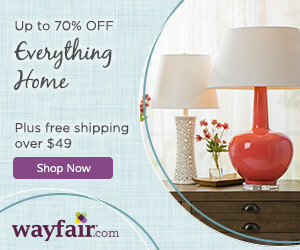 Share them in a comment here.